Hyatt announced several new benefits it will give it’s Diamond Gold Passport members starting within a month. It’s great to see program changes that are positive and actually an ‘enhancement’. The changes are not not groundbreaking, but I’m sure that many Diamond’s like myself can put these new benefits to good use. Starting March 1, 2015 Diamond members who book an award night using points or a free stay certificate for someone else, the guest will get full Diamond benefits during the stay. Hyatt is setting precedence with this new benefit and it’s the first among major hotel programs to offer such a benefit. 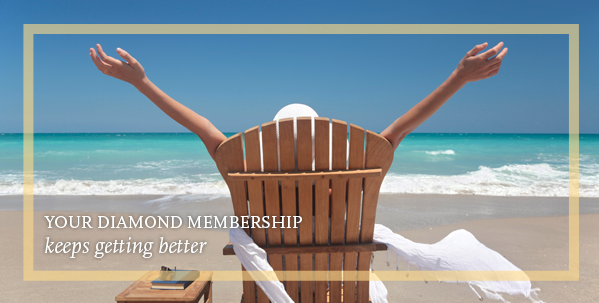 Diamond members will now receive two United Club passes annually starting March 1, 2015. The passes should be sent out in the coming weeks to the mailing address you have registered on your account. This is a nice perk that any frequent traveler can put to good use, and if you already have access to airline lounges consider giving them to friends or family! Lastly, starting February 14, 2015 Hyatt is also giving Diamond members free premium Wi-Fi at all Hyatt hotels. In any case it’s good to see these changes and especially to see hotel programs trying to change the game by introducing new benefits that have never been offered before. I’m sure some Diamond members may gawk at the fact that allowing more people into Club Lounges is not a good thing, but I’d argue that the change will be mostly unnoticeable. What’s your take on the new benefits Hyatt unveiled? Very timely post, right now I’m looking at potential options to complete a hyatt platinum challenge in India, I’m hoping to have a cheap game plan in place and then wait for another promo like ‘endless possibilities’ to come around to maximize my Hyatt hotel stays.